The Four Evangelists and Two Apostles, The four evangelists and the two chief apostles, Walters Manuscript W.530.C, fol. 211r, a photo by Walters Art Museum Illuminated Manuscripts on Flickr. 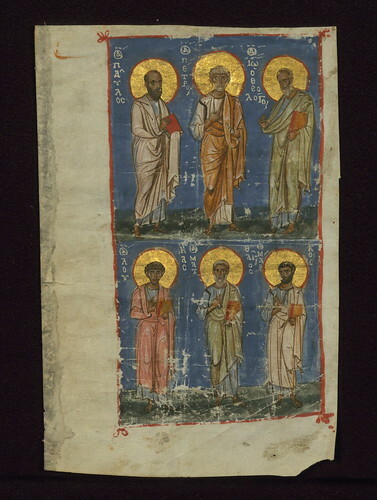 This image originally faced the beginning of the Acts of the Apostles in a late eleventh-century Psalter and New Testament in Mount Athos, Vatopedi Monastery, MS 762. It seems likely that in this manuscript's scribe and illuminator were the same person. The Evangelists and Apostles appear in the following order: Paul, Peter, John (above), Luke, Matthew, Mark (below).